Wouldn't it be nice to know why your competitor is performing better than you on Facebook, or what kind of content makes people feel the love? Or like me, to know what is happening on Donald Trump's and Hillary Clinton's Facebook pages. All of this and more is possible with this handy little script and a bit of data analysis. For a quick preview and to learn how it is done, try to hang on until the end of this post! Cut the BS and show me what Donald and Hillary are up to! To scrape the post data, the script leverages something called Facebook Graph API, which let's other computers to access Facebook's computers programmatically and to transfer data between them. Graph API only accepts authenticated calls, so you need to have App ID and App secret that you pass on to the API upon scraping the data. If I lost you at API, all you need to know is that these two magical components are yours once you create a Facebook App for yourself (don't worry, it's basically just filling up a form, no actual app involved!). Go to https://developers.facebook.com/apps/ and click "Add a new app"
You'll be redirected to App Dashboard, where you'll find your App ID and App Secret. Leave them be for a while. Now let's download our own copy of The Scraper - navigate to https://github.com/minimaxir/facebook-page-post-scraper, click "Clone or download" and "Download ZIP". Extract the ZIP file and open the folder. Pretty self-explanatory. 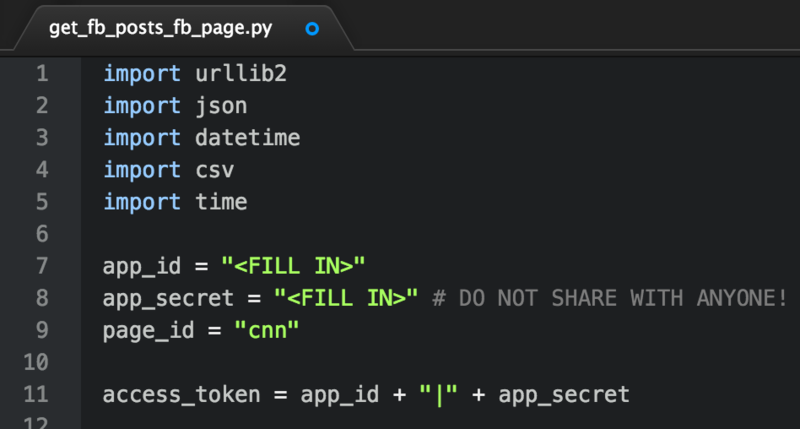 Fill in the App ID and App Secret from Facebook, but wait...page_id? That's the page you want to scrape, for which you need to know its ID. Luckily you'll find this at the end of the page's URL: www.facebook.com/page_id (e.g. facebook.com/hillaryclinton). Save the file. OBS! If you don't know your way around Python (like me), don't touch anything else (I didn't!). Now it's time to run the script! If you're on The One True Computer™ open up Terminal (cmd + Space + Terminal + Enter) to take you back to the DOS era. If you're on a PC, I've heard there's something called Command Prompt. The scraper takes a few minutes to run (progress is updated every 100 statuses), and after it's finished you have a file called page_id_facebook_statuses.csv in the same folder you have the scraper. Congrats, now you know everything about the page you want to know everything about! 2. How to analyze the data? As my end goal is to learn Python and some machine learning along the way I use a framework called Graphlab Create. If you're at all into programming/machine learning, I urge you to try it out as it is pretty powerful and easy-to-use. Coursera's Machine Learning Foundations is a good starting point to get your hands dirty. OBS! Reactions became globally available on 2016-02-24, so keep this in mind when making your analysis. It is probably a good idea to make a new dataset for "reaction era". 3. Yeah, so about that Trump fella?? Trump keeps things simple, he mostly posts photos or plain text statuses. Clinton on the other hand is heavy on videos. Also, didn't know that somebody actually uses notes anymore. You can't go wrong with authenticity and good tacos. 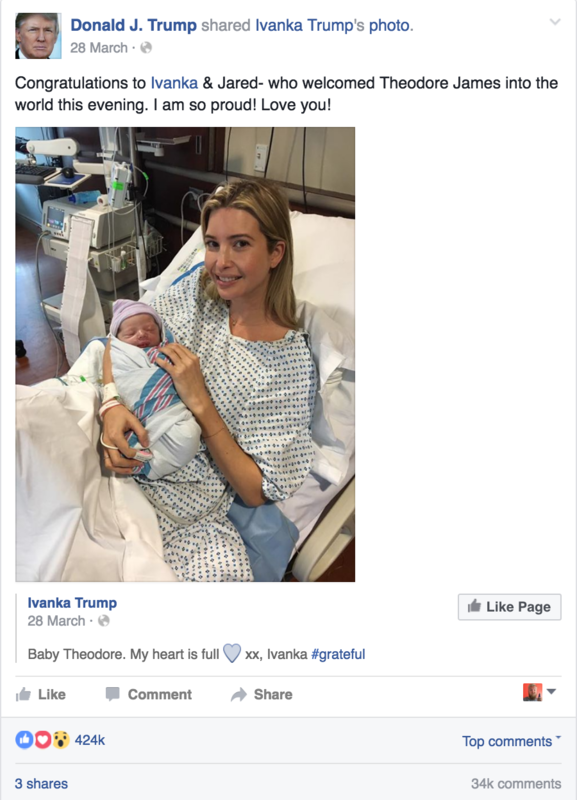 This is nothing but the most liked, shared and hated of Trump's status updates. I'm not going that far to suggest this was planned, but both candidates just recently got a grandson - and their followers LIKED it! 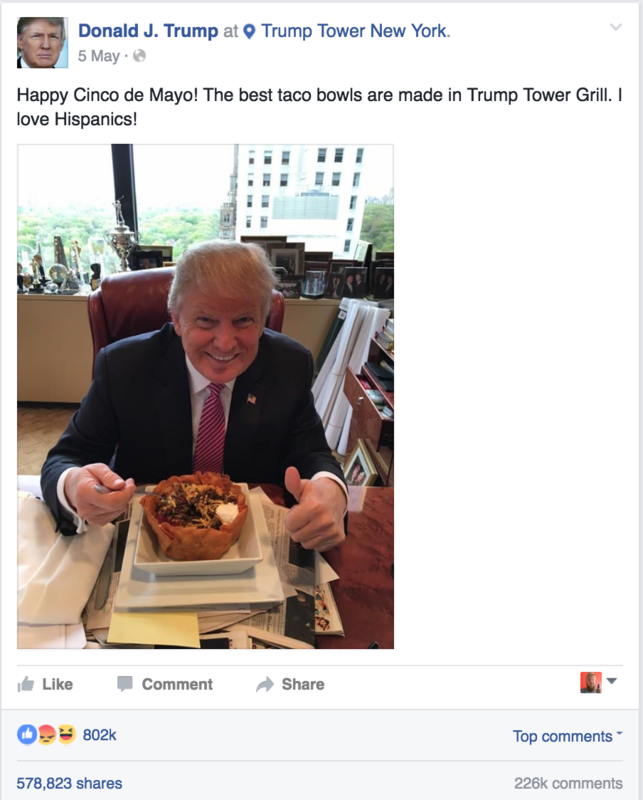 For Hillary the official announcement is her most liked status, and for Donald only Mexican food trumps his family in terms of likability. Sharing is caring they say. Many of the most shared posts on both sides feature the cheating or crooked opposing side. The worst performing post of Donald Trump? The one where he asks people to open their wallets and head to the campaign store. And people LOVE LOVE LOVE it. Massive credit goes to Max Woolf, this post wouldn't have been possible without his work on the scraper. Thank you!